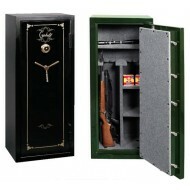 Fireproof gun safes give added protection to the owner. If your firearms are worth protecting from burglars, they are worth protecting from fire. 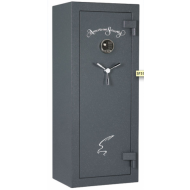 Browse through our selection of discounted fire resistant gun safes from a wide variety of manufacturers. The Stack-On FS-24-MG-E features an electronic lock which is easy to program and easy to access. Door storage system includes removable, zippered bags that let you pack and store your gear in less time as well as a large document pocket and removable holsters for pistol storage – providing flexible storage. This gun safe includes a 30 minute fire protection rating and the approval of the California Department of Justice for safe storage of fire arms. With five locking bolts and water protection, this safe has it all. If you need indoor delivery for this 388 lb safe, please call 1-877-442-9964. There is an extra charge. 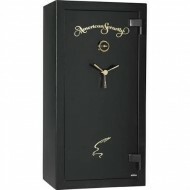 This is an attractive and utlilitarian gun safe at a reasonable price. The American Security 5924E gun safe will hold up to 16 long guns. It is lined in a mocha color fabric to protect your firearms from scratching. The electronic lock is easy to program and easy to use. If you ever have a need to change your code, you simply reprogram the lock. Some of the security features include 4-way boltwork with 8 massive 1¼" bolts and four anchoring holes with mounting hardware. Fire protection is provided by insulation given the Mercury I fire protection label for 30 minutes. In addition the door jamb and door have special seals to protect from fire. Use your gun safe to store other valuables as needed. 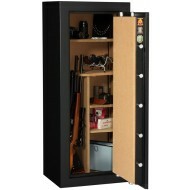 This is a practical gun safe for the firearms owner. Please contacdt us if you need indoor delivery on this 593 lb safe please call 877-442-9964 or email customer service cs@thesafestores.com. There is an extra charge. The Gardall GF6024 18 Gun Safe has a large enough capacity to fit 18 guns securely from theft and unwanted harm. The safe also features 35 minutes of fire protection, which is down to the heating seal around the door, delivering peace of mind to those who require a safe the will keep documents intact in case of a fire. Burglary protection features include a UL listed Group II combination lock, heavy duty hinges and anchoring bolts to fasten the safe securely to the ground. This 16 rifle safe from American Security comes with a Mercury II one hour fire rating. In addition to the fire protection, this rifle safe has great security features.such as 4-way boltwork with 14 massive 1½" bolts. Use the anchoring pre-drilled holes to bolt down the rifle safe to the floor to protect further against burglary. The interior is covered with an attractive velour material. The exterior has an attractive 3 point handle. The SF Series All in One interior come with 2 coverplates and 4 side shelves to allow storage on all sides of the safe. The Amsec FV6032E5 was created to be the best economical introductory gun safe you can get. Offering 45 minute fire protection at 1200 F (maintaining an interior temperature of 350 degrees), this safe is great for storing long guns, ammo and all your hunting gear, or if you like, all your computer equipment. Amsec offers tons of color and accessory options for these safes and we offer all of them. So, if you are looking for your first gun safe, this is it! SF Series rifle safe SF6032 has many high security features: a 1/4" steel plate door, body construction of 12-gauge steel, 4-way bolt work with massive 1 1/4 inch bolts. For added security the rifle safe comes pre-drilled for four anchoring bolts. The all velour interior includes 1 pre-cut electrical access hole for a de-humidifier or light. The door of the SF6032 rifle safe has extra storage including space for two long guns, see through pouches, zippered pockets and two full-width pistol storage systems. With one hour fire protecition, this high end safe has the protection and advantages you need as a gun owner. This American Security gun safe has a capacity for up to 20 long guns. With a 90 minute fire rating UL certified, RSC Burglary rated for home security, this safe is designed to keep its contents safe and secure in difficult conditions. 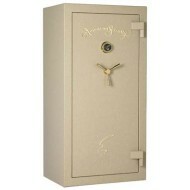 This safe has extra storage with room for two long guns, two pistols and other small valuables. The BF series means you get great B(burglary) protection and great F(fire protection). This is a safe for the gun owner who is serious about protecting his fire arms. Black textured finish with either chrome or brass hardware. Comes with a premium door organizer.